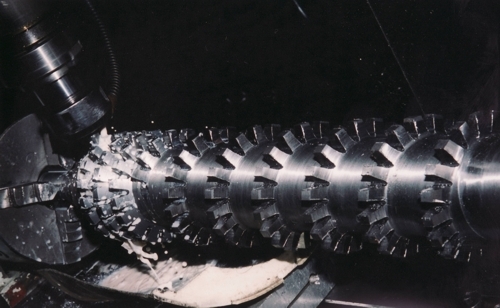 Using our specialized machines and attachments, we can produce a variety of complex sections to your feed screw; to create shear, improve dispersion or for use with heat-sensitive materials. Our capacities to turn up to 40" diameters with lengths of 250" allow us to make longer screws and components. We have manufactured screws exceeding 300" in length with sections threaded together and lined up with perfect concentricity and straightness. 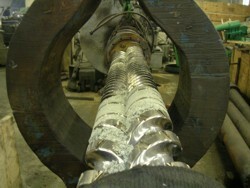 North American Feed Screw can also provide deep hole drilling, shaft straightening and polishing up to 250" long. Working with precision and an experienced eye, all materials are prepared to perform with maximum strength and dependability. We can grind to an accuracy of 0.001" in diameter over 250" in length with quality checks conducted at each stage. Surface hardening is a key component in finishing. We utilize all types of surface hardening materials including Colmonoy 56, Stellite 6 or 12, etc. Nothing beats the skilled tradesman when quality is important. 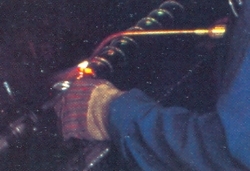 Our welders have a combined knowledge and experience of over 50 years. 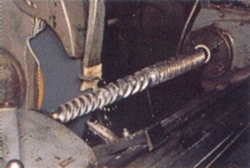 Pressing out seized screws from barrels is a key expertise at North American Feed Screw. We have both the experience and the equipment to get the job done. Our 600 ton horizontal press can handle the largest of seized screws and barrels.